It rained overnight, and threatened more during the morning, but luckily it didn’t materialise until the end of our walk this morning. On the norther coast of Gower is a fantastic nature reserve, now in the stewardship of the National Trust. But the nature reserve was not the main focus, but an unusual lighthouse was. It needs a little determination to get a view of the Whiteford Lighthouse, requiring a 2 mile walk along the costal path, which in part has been washed away by recent storms, but walking along the beach is always a pleasure. This is an unusual lighthouse in a number of ways. 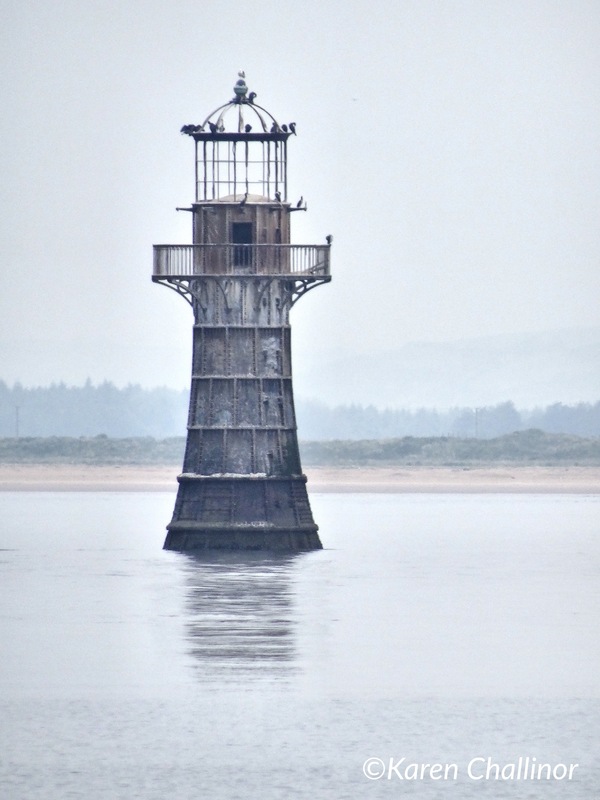 Instead of being the usual stone built edifice standing offshore, the Whiteford Lighthouse is made of iron. It was the only operational cast iron light house to actually stand in the sea on the British coast. As trade increased at Llanelli and Bury Port it became apparent that the safety of shipping had to improved. This is a difficult stretch of water as the conflicting current from the Bury Port Estuary and the Atlantic Ocean made it difficult and dangerous to navigate. The lighthouse was built in 1865, working through until 1933 when the light was extinguished. Whiteford (pronounced Witford), its name being corrupted from the Viking word Hvit Fford, is a large expanse of sand (Whiteford Sands), and dune, forest and estuary (Whiteford Burrows). However, there were still disasters even after the light was lit. In January 1868 sixteen coal ships were wrecked on the beach. They had only come a short distance form Llanelli, but a sudden ground swell left them floundering off the point of Whiteford. The bodies of the crew from all sixteen vessels were laid to rest locally in the neighbouring graveyards of Llangennith Church and Llanmadoc Church. Before the estuary was dredged, it is believed that huge stepping stones lay across the divide between Whiteford Point and the coastline of Dyfed, allowing access across the quicksand and mudflats at low tide. These have long been swallowed in the long history of the Burry Estuary, but another causeway, from Whiteford Lighthouse to Burry Port remains partially intact (but totally impossible to follow for any distance). We didn’t try to find these – not even I would attempt to persuade her this would be a good idea! The whole sand dunes, forest and beach are a fantastic and magical place. So I thought I’d leave you with a photo of a pair of Common Blue Butterflies that were intent on creating the next generation. Looks a magical place, Paul. Beautiful images!